What's New at Zephyr Kennel? Ian earned his second major on December 6th and picked up a few additional points toward his championship over the same weekend by goig BOW each day he showed. Zoom picked up a few more points towards her championship in December. Lark picked up another Double Q toward her MACH on Nov. 16th. Lark finished her Rally Advanced title on Nov. 9th with a third place. Ian picked up his first major at the Kenosh Kennel club show on Sept. 7th by going BOB over three Speicals! June picked up a Double Q at our club's March AKC agility trial. I also had the honor of finishing Ian's Open Standard title that same weekend. Zoom earned her second major at the shows in Grayslake, IL on January 26th. June & Lark both picked up a Double Q toward their MACHs at the NSDTRC (USA) Region 2 sponsored AKC agilty trial in January. 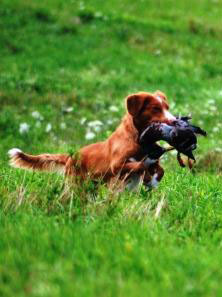 Eta enthusiastically retrieves a bird.